Paneurhythmy in St. Louis, Missouri. Paneurhythmy in St. Louis, MO! March 25th through September 22nd - Come dance with us in Forest Park! The moving meditation Paneurhythmy takes us through the process of Transformation and is open to all. We meet on the East Side of the World's Fair Pavilion Hill in Forest Park to play Paneurhythmy at 7:00 a.m. on Wednesday and Saturday mornings. When raining, we gather under the Pavilion if it is available. All are welcome. Please call us at 314 - 647 - 9415 for more information, and so that we may be expecting you for the event. March 25th through September 22nd - We meet on the East Side of the World's Fair Pavilion Hill in Forest Park to play Paneurhythmy at 7:00 a.m. on Wednesday and Saturday mornings. When raining, we gather under the Pavilion if it is available. All are welcome. Thursday March 22nd - Paneurhythmy begins in Forest Park on this special sacred day, at 10:00 a.m.
We will celebrate brunch afterwards. Saturday March 24th - Paneurhythmy in Forest Park at 7:30 a.m. Discussion of Saturday starting time. Continues each Saturday through September 22. Wednesday March 28th - Paneurhythmy in Forest Park at 7:30 a.m. This time may be changed. Continues each Wednesday through September 22. 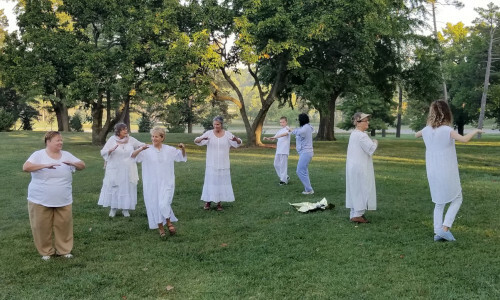 We are now meeting the sunrise every day on Art Hill; performing and studying the six Morning Exercises and Paneurhythmy; and, sharing insights and blessings. Wednesday Mornings - 6:45 AM. Saturday Mornings - 7:00 AM. We are meeting in Forest Park on the east terrace on the World's Fair Pavilion Hill and dancing there. One can easily park nearby; it is a short walk from the road and easily visible. Wednesday Mornings - 8:00 AM. Saturday Mornings - 8:00 AM. We are now meeting in Forest Park beside Post-Dispatch Lake west of the Boathouse. There are benches nearby, and an engraved stone. We are across the street from the Worlds Fair Pavilion Hill. One can easily park there; it is a short walk from the road and easily visible. In case of rain, we meet under the overhang at the south end of the MUNY entrance, or under the Pavilion at the top of the hill. In case of Special Events which disrupt the traffic flow, we will try to make arrangements in advance. Please call us at 314 - 647 - 9415 for the Wednesday morning events. We will perform Paneurhythmy at various festivals. On Memorial Day Monday we will present it as part of the Peace Memorial Day Celebration. A special service begins at 10 a.m. Dr. Carl Van Alstine hosts this annual event. After the morning session, the group will proceed to Tower Grove Park at 1:00 led by Joia. Upon arriving at the park, the group will form a big circle and perform movements from the Paneurhythmy together. Paneurhythmy: Circle of Joy will have an information booth during the potluck picnic and celebration to follow. There is no charge for participation in this event. For exact locations and information, call 314 - 647 - 9415. In case of rain, we will meet under the overhang at the south end of the MUNY. In case of Special Events which disrupt the traffic flow, we will try to make arrangements in advance. Please call us at 314 - 647 - 9415. We will perform Paneurhythmy at various festivals. On Memorial Day Monday we will present it as part of the Peace Memorial Day Celebration beginning at the Divine Science Church on Wyoming. A special service begins at 10 a.m. Featured speaker is Jeff Smith. Phyllis Thorpe has been asked to speak on a panel representing Paneurhythmy and Native American spirituality as ways to "Inclusivity Consciousness." Carl Van Alstine is hosting the event. After the morning session, the group will proceed to Tower Grove Park at 1:00 led by Joia. Upon arriving at the park, the group will form a big circle and perform movements from the Paneurhythmy together. Paneurhythmy: Circle of Joy will have an information booth during the picnic and celebration to follow. There is no charge for participation in this event. For information, call 314 - 647 - 9415.
the 1st and 3rd Mondays, until March 22. Any questions? Call: 314 - 647 - 9415. Wednesday Mornings - 7:00 AM. We are now meeting at the bottom of the Worlds Fair Pavilion Hill across from the fountain, near the lake to the west of the Boathouse. One can easily park there; it is a short walk from the road and easily visible. We will perform Paneurhythmy at various festivals. On Memorial Day Monday we will present it as part of the Peace Memorial Day Celebration beginning at the Divine Science Church on Wyoming and proceeding to Tower Grove Park at 1:00 led by Joia and the Viva Vox! young people. Upon arriving at the park, the group will form a big circle and we will emerge from it to begin the Paneurhythmy in the center. to which it is the key! Any questions? Call Phyllis: 314 - 647 - 9415.